Originally published in 1999, Alister Begg’s Preaching for God’s Glory is a welcome reminder that points to the necessity of expository preaching. Begg argues that preaching should by definition be expository, “Bible-based, Christ-focused, marked by doctrinal clarity, a sense of gravity, and convincing argument.” He clearly chronicles the tragic demise of this kind of biblical preaching which is of no advantage to God’s people. The tragic failure to preach expository sermons has resulted in confusion and malnutrition. “The tragic medicine,” writes Begg “for this disease is the preaching and teaching ministry that God has established to bring his people to maturity. Begg explores the nature of expository preaching. Preachers must begin with the text, stand between two worlds, and show how a given text is relevant in the twenty-first century. Finally, Begg discusses the benefits of expository preaching. 1. It gives glory to God alone. 2. It makes the preacher study God’s Word. 3. It helps the congregation. 4. It demands treatment of the entire Bible. 5. It provides a balanced diet. 6. It eliminates Saturday night fever (or last-minute preparation). 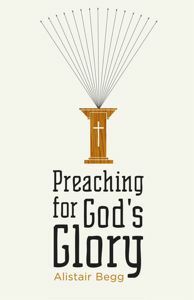 Preaching for God’s Glory is a worthy addition to a small list of worthwhile books on the preaching task. Begg does not pretend to offer a comprehensive look at preaching. It is, however, a reaffirmation of the importance of expository preaching that must not go unheeded. Indeed, all pastors must embrace the mandate to preach for God’s glory.